My new quilt design, Gathering Favorites is FINALLY finished! Yes...FINISHED...the binding is on, and the pattern cover picture has been taken. For everyone who pre-ordered the pattern, it will be in the mail to you tomorrow. Yippee!! I wanted to make another quilt with tiny 9 patches (they are 1 1/2" finished) and I decided to use some of my favorite fabrics, hence the name Gathering Favorites. 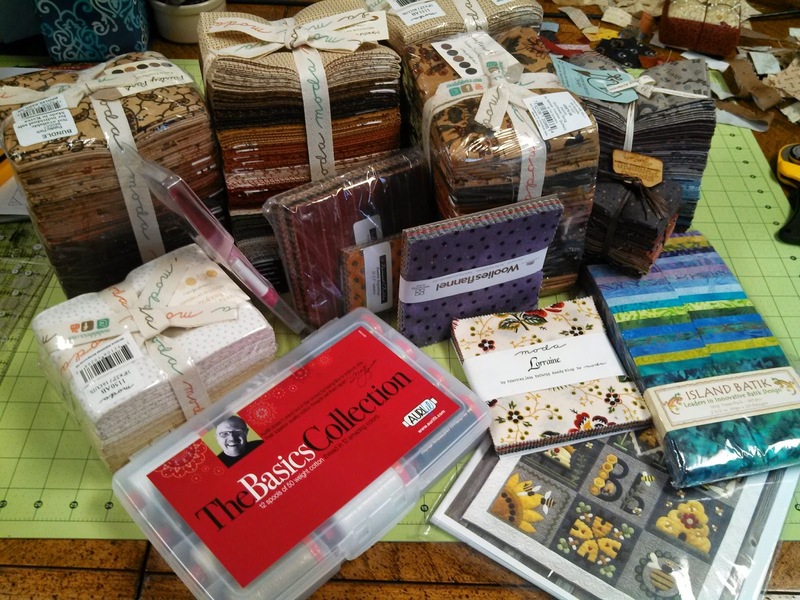 Do you have favorite fabrics that you are hoarding (lol!) because you just can't imagine being without them? This is the quilt for you - you can use lots of your favorites - and you only need to use 1" of them, so no fear of using them all up! 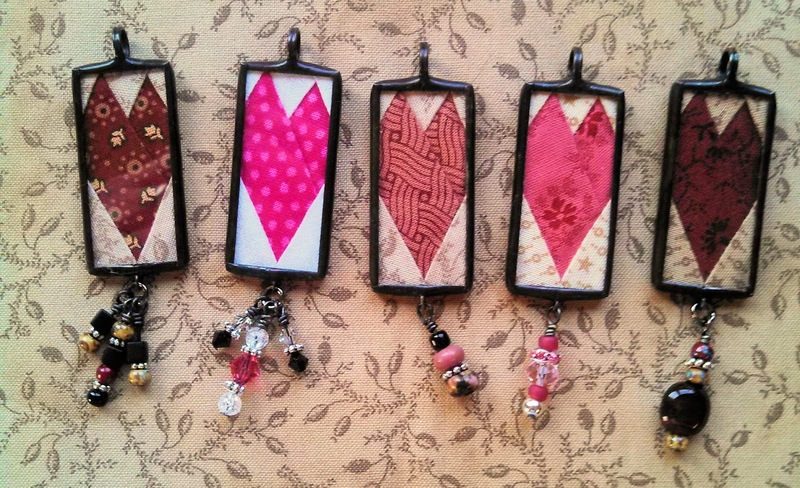 I'm linking up to Julie's Binding Blitz post! Go check it out and see what everyone else has finished this month! 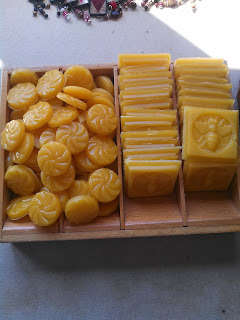 I had a really great time at Market - found some great deals at Sample Spree, and got to see lots of old friends and met some "online friends" as well - lots of fun! Here are most of the goodies that I brought home. 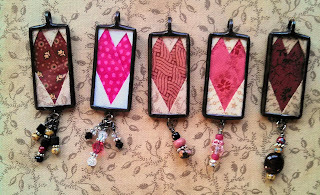 Some of them were things handed out at Schoolhouse classes, and most of the fabric I bought at Sample Spree. I really wanted a bundle of Miniature Gatherings - the new line by Lisa Bongean, and I was lucky enough to get that and also purchased her 2 new rulers. 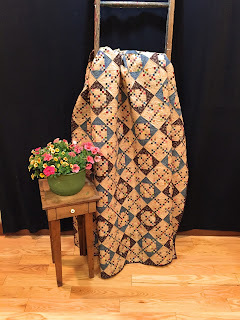 I added a nice bundle of Kansas Troubles fabric to my purchases - and I have a plan for those that I will tell you about at a later date! 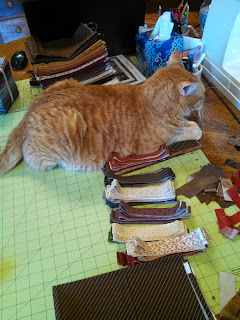 See that bundle on the right...the fabric by Lynette Anderson? I won that at her Schoolhouse class! 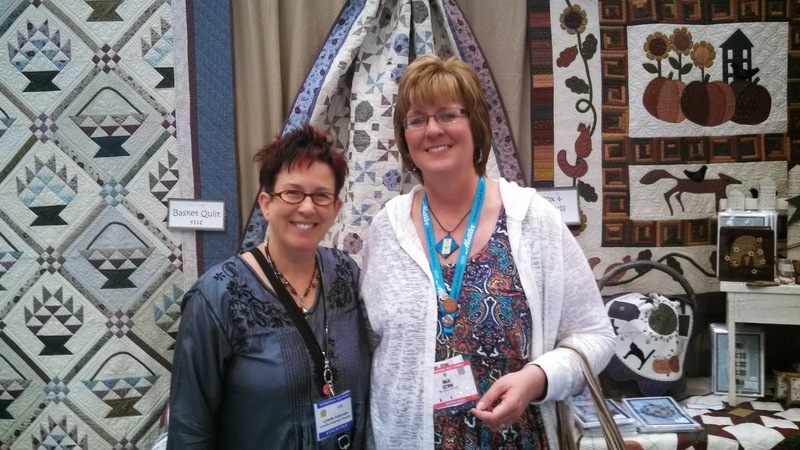 Lynette has been a customer of mine for a few years now, but we had never met in person. I didn't want to bother her before class, and had intended to introduce myself afterwards. But...she drew MY name for the giveaway! It was really funny, because she had no idea that I was in the room. When she drew my card, she started laughing, then introduced me to the room. I had the opportunity to speak to Lynette and her husband, Vince, several times while I was at Market - they are the nicest people. So glad to finally be able to meet them in person! I bought the bee pattern - it is so cute. It's by Wooden Spool Designs, and I can't wait to work on it. That was one of the few pictures that I took while I was there (I know some of you are not surprised by that!). I couldn't wait to cut into those Miniature Gatherings fabrics, and evidently Ozzie couldn't wait to share his fur with them! I wasn't even done cutting, and he was already laying on them! 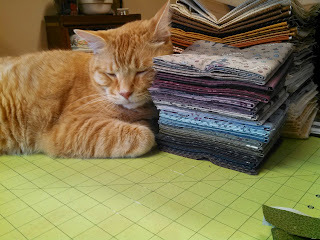 And it seems that Ozzie also loves Lynette's fabrics, as he took a little nap on them! Callie was not nearly as interested in my new stuff- so no pictures of her this time. 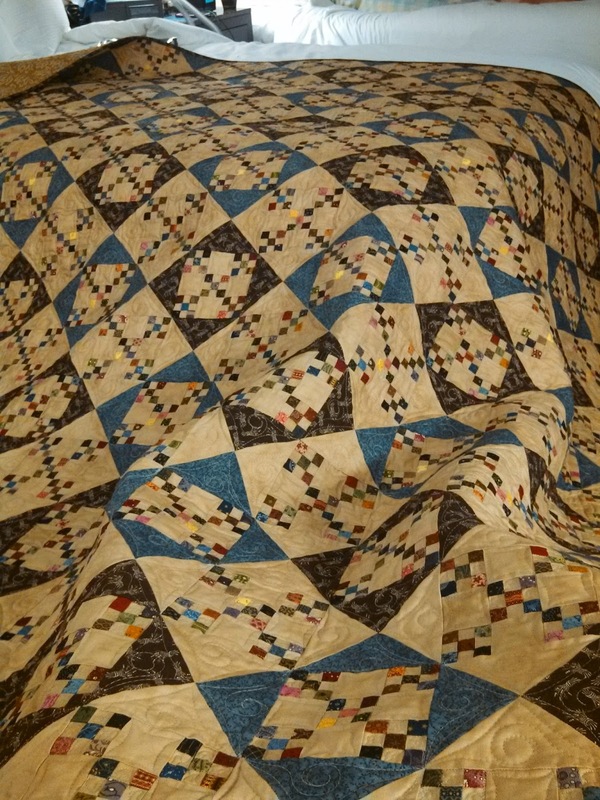 I got my newest quilt design back from my quilter a few days before we left, so I took it along, and Aunt Nancy sewed the binding down for me. Now all I have to do is get a good picture (UGH...that is the hardest part!) and the pattern will be published. The 9 patches finish at 1 1/2". 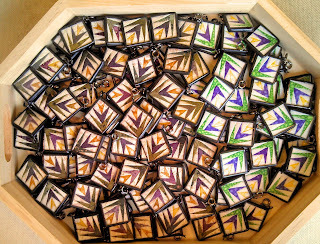 And now I have to get back to work - we are getting ready for the Kansas City Regional Quilt Festival - can't believe it's only a few weeks away - EEK!!!!! 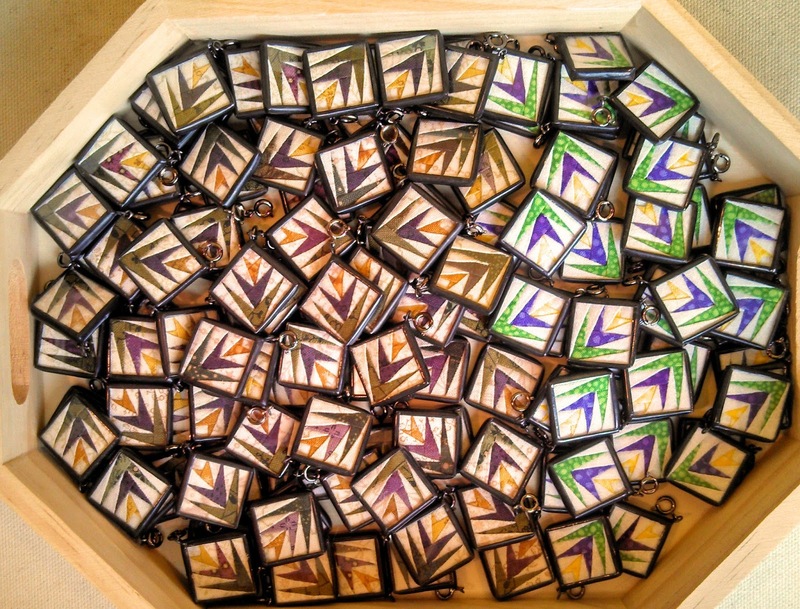 Charms and off to Market! 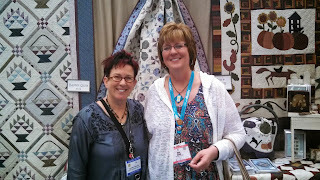 And tomorrow I am off to Quilt Market! 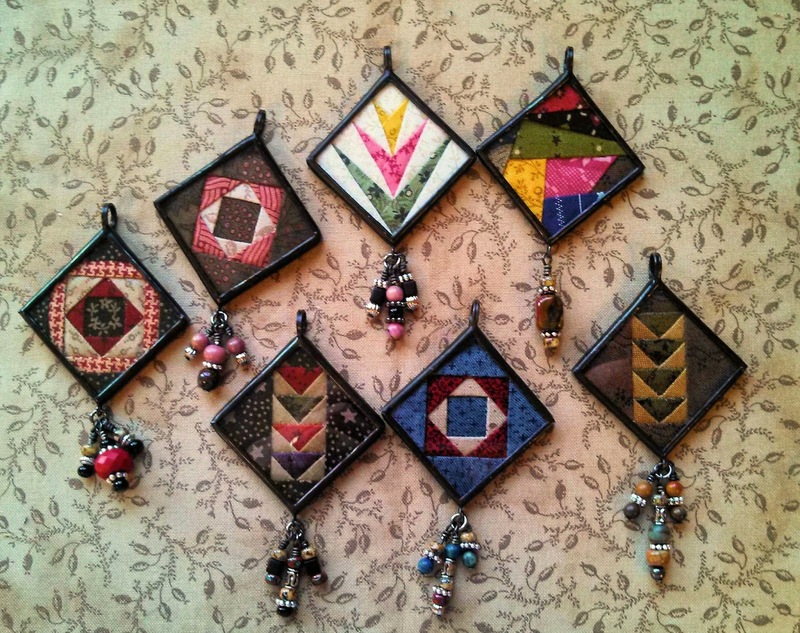 Many of you know Tara Baisden (you may know her as Tara Lynn Darr) of Sew Unique Creations - she is a very talented pattern designer and has published tons of patterns and also some wonderful books full of small, scrappy quilts (don't we all LOVE those!?). Not only is Tara extremely talented, she is also a very kind and thoughtful person. Unfortunately, Tara recently was in a horrible accident and is facing a long road to recovery. Some of her friends have started a Go Fund Me page to help to cover some of her expenses during this rough time. You can read more about her accident on that page. If you have ever been in the hospital, you know how those bills pile up in a huge hurry, and also that insurance does not cover everything. Please go to her page and read the full story there, and if you can help Tara at all, please do so. At the very least, keep her in your prayers! 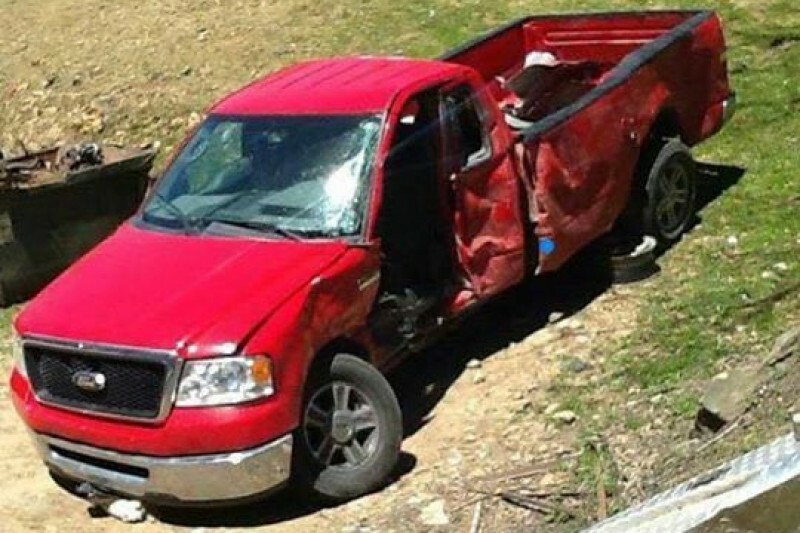 Here is a picture of Tara and of the truck she was in when the accident happened. It really makes you think about how life can change in an instant and we really do need to appreciate every moment. Everything here is business as usual - I have a ton of things on my to-do list to prepare for the Kansas City Regional Quilt Festive in June. 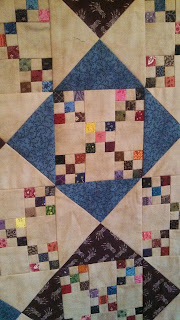 I have been working on a new quilt, and just got it back from the quilter yesterday. Now it's time to get the binding on and finish up the instructions and get it into print. We took pre-orders for this quilt at our last show in Stover, MO - so if you pre-ordered....it will be there before too long! 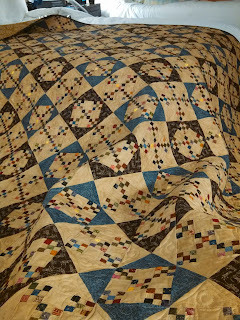 The name of the quilt will be Gathering Favorites, and it has a ton of my most favorite fabrics in it. If you want to see a sneak peek of it, you can go to my Instagram page. 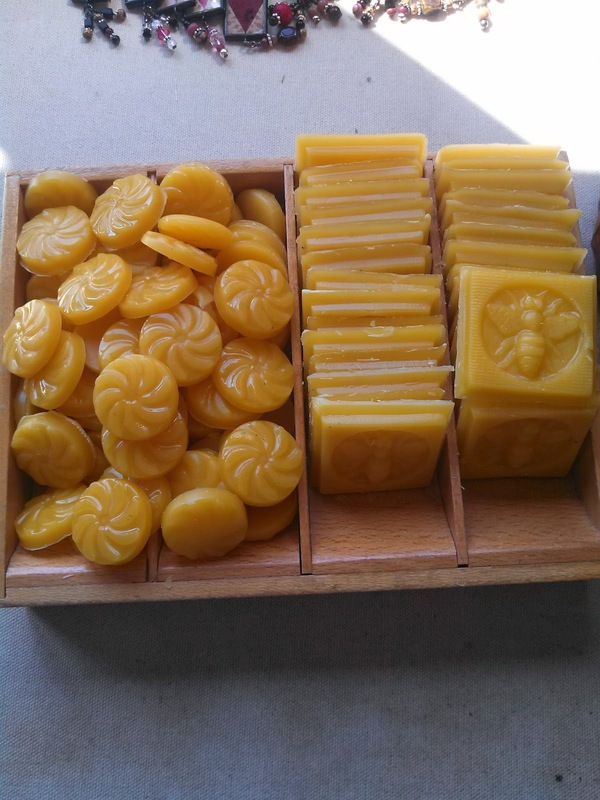 I'm excited to be going to Market in Minneapolis next week, and look forward to seeing lots of old and new friends. Hope to see some of you there!! Have a great weekend! And don't forget - please help Tara out if you can !